Q: You’ve recently announced $1.31M Seed funding round; could you tell us something more? A: Cygnetise was incorporated May 31st 2016. The founders put up some cash to build a proof of concept and signed an incubating agreement with boutique London based finance company, Scorpeo. Following the delivery in late August 2016, we raised GBP 100k (USD 131k). We then built out the product to a demo version, so that we could show it to potential clients and investors. We raised again, GBP 500k (USD 655k) which enabled us to progress to an enterprise product and start to pilot within several organisations. We launched in April 2017, and are adopting more and more companies as we continually build out the application. Our total funding is circa USD 2Million. Q: What is the story behind Cygnetise, how did you start? A: I spent around 18 years working in operational change within large banks and brokers. Much of this time was spent as an internal consultant, analysing specific locations, sub-businesses and functions for inefficiencies. I would be required to identify efficiency and risk issues, and offer solutions to fix them. The birth of Blockchain brought a new piece of technology that can solve a whole heap of problems, so we got to work looking at the most appropriate ones. Following a discussion with Shaun Blake (co-founder and director), we believed that the management and distribution of authorised signatory lists was still a very antiquated process and could be revolutionised by blockchain technology. So we set up the company and here we are. Q: What are the main benefits of using Cygnetise? A: Firstly, the risk of fraud is significantly reduced. Signatory lists are most commonly shared by emailing scanned copies. These can clearly be intercepted and altered with some very basic software. They are also updated infrequently due to the existing convoluted processes. With Cygnetise, the signatory lists can be edited and maintained real time. That alleviates potential delays in distributing changes to any given list and thus narrows the window in which either a new signatory must wait to start signing documents or a removed signatory is allowed to keep doing so. 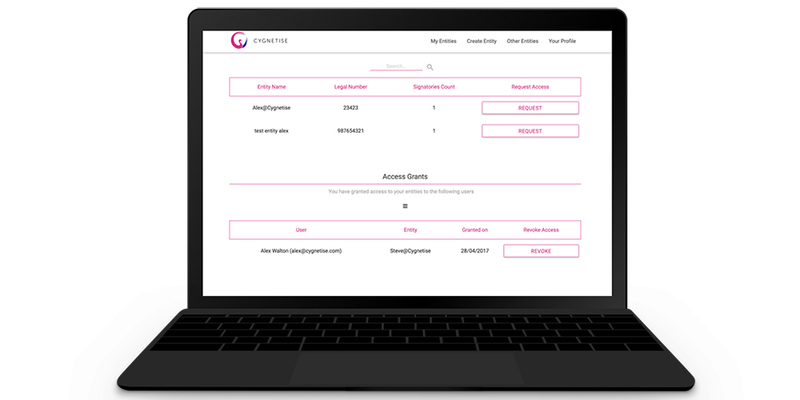 In this way, the platform gives companies the flexibility to grant and revoke interaction rights to partners instantly using a permission-based collaboration model. 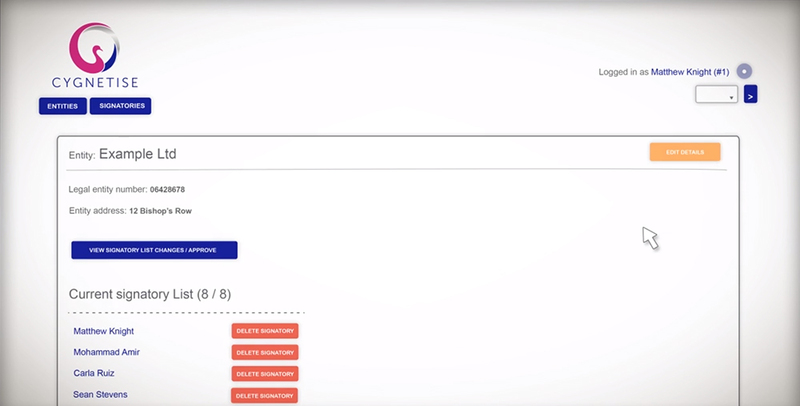 There are also huge benefits for companies ‘receiving’ or viewing signatory lists via the Cygnetise application. Again large organisations may have to organise hundreds and thousands of incoming lists which are received in a variety of formats. There can be huge efficiency savings if signatory lists from counterparts all are maintained Cygnetise. We actually believe that it will encourage governance, risk, audit and control bodies to review existing practises. A: The priority is to rapidly expand our client base. We are trying to focus on some specific regions and industries in order to gain localised spots of critical mass. Clearly the higher the participation of the application, the greater the benefits there are for all. We also have some very clear ideas about expanding the functionality of the application but we wouldn’t want to give away too much at this stage.